Anyone who has worked in a multi-monitor environment will tell you that the more displays the merrier things are. Sure, having two or even three monitors on a desktop isn't unheard of – but what about six? That's what AMD is introducing today with the ATI Eyefinity. 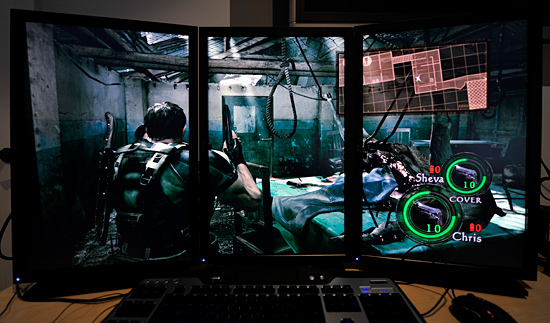 Eyefinity will be a feature of the upcoming Radeon family of DirectX 11 enabled graphics processors, which will give PCs the ability to seamlessly connect up to six ultra high definition displays in a variety of portrait and landscape configurations – all with a single graphics card. AMD boasts that the Eyefinity is able to combine so many displays that it'll be able to produce a resolution that approaches "eye-definition optical clarity" at 12 times 1080p high-definition. With a combined theoretical resolution of 268 megapixels, AMD says that it is roughly equivalent to the resolution of a 90 degree arc of what the human eye sees.